tallgrass prairie studio: Big News from the MQG! Big News from the MQG! Your team at the MQG has been busy working behind the scenes and we're so excited to announce QUILTCON, the first Modern Quilt Guild conference and show February 2013. It's going to be fabulous! Find out more at our new website! Austin here I come!! I wouldn't miss this for the world. Will you be there? That is big news!!! It looks like fun. 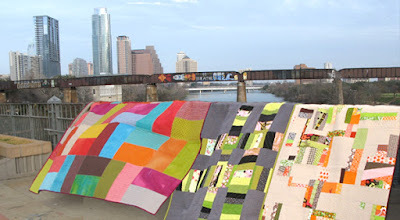 How great to have a conference for just modern quilts! This is awesome! Thanks for sharing the big news! I'm so excited! I live in Texas and can't wait to go! Woohoo! This is going to be a great venue for an amazing conference. I can't wait! I hope you're on the list of instructors! Perfect! My sister lives 15 minutes from the convention center and has already offered to let me crash on her couch! Made my hotel reservation already! This is so exciting! Thanks to you and the rest of the MQG board for all the work you've put in to make this happen. Modern quilters of the world truly appreciate it! I'm coming! Does this mean I get to meet you? Woooohooo!!!!! Made my hotel reservations today! absolutely! i am so excited. i have never been to Austin either. but i am not really sure how much i'll see of it. Soooooo hoping to be there!